From the capital city of Richmond, with its progressive urban flavor, to the coastal area around Norfolk that is quintessential eastern seaboard, the state of Virginia carries a rich hospitality tradition. Southern comfort food dominates the menu in rural mountain towns like Natural Bridge and Stanton, but the inventive and thoughtful cuisine found in cultural centers like Roanoke and Charlottesville qualifies as top gourmet fare. 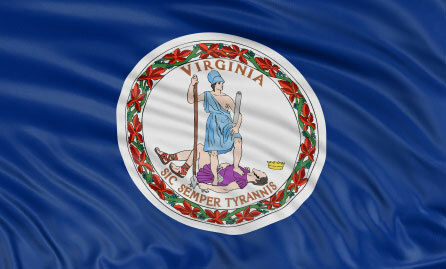 Universities are numerous throughout the state and some offer great culinary arts schooling for Virginia would-be chefs. Historical schools like Washington and Lee University and Virginia Military Institute are not likely to educate you in the kitchen but the rich educational tradition they embody creates fertile grounds for you at other nearby schools. Southern hospitality is a well-known phenomenon that points up Dixie’s ability to make you feel right at home, and food is at the center of it. Virginia Beach and other tourist towns on the coast are famous for seafood like the famed Chesapeake Bay Blue Crab. 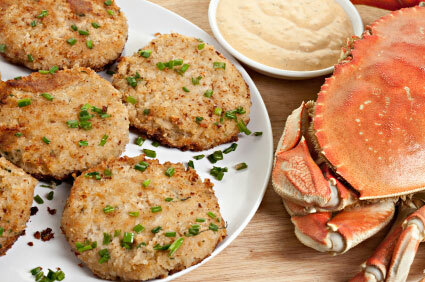 The bounty of the Bay provides the backbone for traditional crab cakes that lumps the delectably sweet meat of the Blue Crab with seasoned breading and herbs before pan frying them. Creative chefs transform the ocean’s daily bounty into culinary wonders that cannot be appreciated elsewhere. Dairy and cattle are leading industries in Virginia, so local chefs have more than just Virginia peanuts to put into their pots. Artisan cheeses are award winners in this sate that now competes head-on with Wisconsin and California to be the top dairy producer each year. Farms nestled in the undulating valleys of the Blue Ridge and Appalachian Mountains raise unique cattle breeds like Limousine and Black Angus that are prized by chefs for their high quality meat. Virginia has carved out a niche among domestic wine producers for delivering high quality wines that are made from locally grown grapes. Prized beef, world-class dairy, and noteworthy wines: is it any wonder that the state of Virginia occupies her own special place in the culinary dreams of passionate chefs-to-be? When you’re out for the best education possible, there are a couple things that you should consider. The type of degree you seek will steer your educational ship in a certain direction, so it’s important to refine your chef dream before you start school. The hospitality industry represents a large pool of employment opportunities that require training in specific disciplines. By visualizing your dream job, you are better prepared to hit the ground running on the proper path to your personal success. Are you a hands-on kitchen professional who wants to make a mark by creating inventive gourmet pastries? If so, the Pastry and Bakery Arts course of study might be just the right match for your dreams. If you are a management oriented worker who can see yourself in a variety of supervisory jobs, then the Hospitality Management program will lay the best groundwork for your success as a hotel or restaurant manager. Bachelor’s degrees are four-year programs that allow graduates to step into management roles right out of school. Associate’s degrees are two-year curriculums that prepare graduates for specialized jobs within the industry like line cook, sous chef, hotel front desk manager, or banquet coordinator. If you're looking to latch-on to the basic skills and get yourself employed ASAP, then consider worthy one-year Diploma/Certificate courses that hammer home the fundamentals and set you on the course to grow your career on the job. A required part of your culinary training must be a thorough exploration of the local food scene. Check out the best local eateries, and learn about the area’s most celebrated chefs. Dissect inventive dishes and learn nuances of flavor with your own culinary point of view in mind. Local festivals and food-centric events provide excellent opportunities for cooking students to get a finger on the pulse of the local food scene. Creative Virginia chefs prepare regional ingredients to showcase their own restaurants and get noticed, so they usually put their best culinary foot forward. As a student you can get involved by watching and tasting, but a far better approach is to volunteer in a festival kitchen. Making contacts that will serve you in the future is a natural byproduct of the culinary cross-pollination that occurs at foodie gatherings. Iron Chef style competitions have become mainstays at these cooking events, and they often include student categories that put your kitchen chops in the spotlight. Charlottesville Vegetarian Festival, Charlottesville – Focuses on the bounty of the land and the culinary buzzwords; sustainable farming. 6000 visitors hit the one day fest each year to sample vegetable creations from local trendsetters in meatless cooking. Students are sure to benefit from exposure to a national trend that involves responsible food practices, from farm to plate. Virginia Wine Festivals –The State has emerged as one of the top wine producing regions in the country. Hybrid wine grapes lend themselves to high yields in Virginia’s climate; so many wines are produced from local grapes. The state features dozens of festivals that play up the fame of Virginia wines. To navigate the landscape efficiently, consider only those festivals that draw 20+ winery exhibitors. Chincoteague Seafood Festival – Best of the best local seafood preparations are featured at this spring festival. Little Neck clams, oysters and fish are presented among traditional side dishes of the South. Culinary Institute of Virginia – The Associate’s in Applied Science Degree from the cooking school at ECPI University prepares students for kitchen work in a variety of industry settings including, resorts, cruise ships, fine-dining restaurants, and banquet facilities. The 15-month program includes externships throughout that prepare a student with hands-on technical application of classroom skills. J. Sergeant Reynolds Community College – Richmond – Hospitality Management, Tourism, and Culinary Arts are the focus of degree programs at the capital city campus. Associate’s in Applied Science-Culinary Arts is an intensive course of study that is accredited by the American Culinary Federation. The Art Institute of Washington – Arlington – This nationally accredited cooking school is located in the D.C. suburb of Arlington, VA, which provides a bustling hospitality industry for work-study opportunities. Stand-alone culinary academies provide an advantage in their specialized structure by graduating students on a faster track than conventionally oriented curriculums. If you want to get out and get on the job, then embrace an intensive program that won’t have you sitting idly by between semesters.